All rabbits can sit on their hind legs and stretch up, so learning to obey the command “beg” is a training task that your rabbit does with enthusiasm. 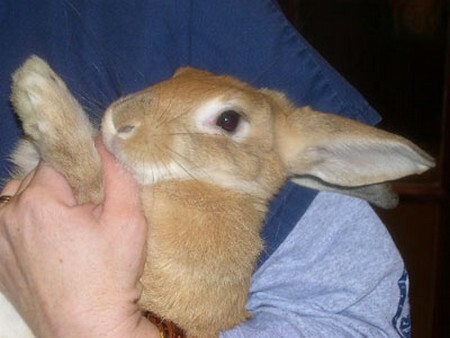 The primary requirement is that the rabbit already be tame. Always postpone feeding until the end of the training session; hunger is a good incentive for compliance. Hold out a treat such as parsley or dandelion to the rabbit at floor level. As soon as it begins to nibble on it, slowly raise the treat. The rabbit reaches up after it and stands on its hind legs. Repeat this practice regularly. Some dwarfs will also learn to stand up if you only raise your hand or snap your fingers. In spite of their small body size, dwarf rabbits can jump quite high. Encourage this natural talent by setting up hurdles in the house for your dwarf and getting it to jump over them. The obstacles should not be higher than the rabbit (measured sitting, not while begging). The length of the hurdle should be about 15 inches (40 cm). It’s best to set the hurdle against a wall, or your clever dwarf will quickly realize that the hurdle can also be run around. Small hurdles can be made of wooden blocks, bricks, heavy books, or full cans of food. At the beginning tempt the rab­bit over the hurdle with a treat. Jumping is such fun for most ani­mals that later they will jump any hurdle all by themselves. You should also offer the dwarf rabbits opportunities for activity in the outdoor pen. A hollowed-out tree trunk, available from the pet supply store, serves as a jun­gle gym and a protective cave, and two bricks on which a board is leaned at an angle offer an interesting lookout and shelter. The rabbit has to reach and stretch to get at the healthy treats, which keeps it fit and strong. If you enjoy crafts, you can copy the nibble tree for your dwarf. The base consists of 1/2-inch- (12-mm-) thick plywood. The diameter of the base is about 15-3/4 inches (40 cm). For the trunk, use a squared timber or piece of tree trunk with bark about 12 inches (30 cm) long. Indentations and holes are bored at different heights in the trunk. The treats are then stuck into them. Now the trunk is firmly screwed into the base from the bottom. The construction must be stable and not wobble, or the dwarf rabbit won’t use the nibble tree. Finally, stick treats like parsley, fresh branches, carrots, or dandelions in the different openings. The daily free exer­cise in the house becomes especially interesting when you create a play land­scape for your dwarf rabbits. Wonderful caves to creep in and out of can be made from large cardboard cartons in which you have cut openings. A shallow wooden box filled with plain white paper towels or toilet paper becomes a marvelous cuddling and burrowing box. A cat pan filled with cat litter invites dig­ging and burrowing. Homemade bridges of boxes and wooden strips make connec­tions between indi­vidual objects that the rabbit can run over and under. Make sure that everything is firm and secure. The rabbit will use wobbly equipment only once and then never again.